Three years ago my husband, daughter and I decided we wanted to adopt a rescue dog. We started attending adoption events and soon met a small puppy who stole our heart. The poor pup had been abandoned in a parking lot, was badly injured, and clearly neglected as well. We so wanted to bring love and affection to her life and began the adoption process right away. It turned out another family had started the paperwork before us and so, to our disappointment, we did not end up taking her home. Although we were sad we also knew that what really mattered was that this puppy had found a home and was going to receive the love and care she so needed and deserved. I was thinking about this pup the other day, about her new life, and about all the animals who have been abandoned and the amazing organizations that work to find them homes. Greenhill Humane Society is one such organization. This local nonprofit houses a variety of homeless animals including dogs, cats, bunnies and guinea pigs. Their goal is to reunite lost pets with their owners and find homes for animals who have been abandoned. Their mission is not an easy one though. The Humane Society of America estimates that 500,000 pets nationwide are neglected or abandoned annually due to emergency hospitalization or sudden death of an owner. Greenhill only receives funding from charitable donations and fees for service which means that they are always in need of donations both monetary and in-kind. With this in mind I called Greenhill and asked what type of donations small children might be able to contribute. They said that they are often in need of simple toys for their rescue animals to play with while they are staying at the shelter. My daughters and I explored the internet for different ideas and eventually decided we would make T-shirt tug ropes for the Greenhill dogs. 1. We started by gathering all the T-shirts from our closets that we were willing to part with and had few words on them. It totaled about 12 shirts. 2. We laid them out, cut off the sleeves and then cut the T-shirt into strips about 2-3 inches wide. 3. We gathered the strips into groups of 9 and bound each group of 9 strips together with another separate T-shirt strip. 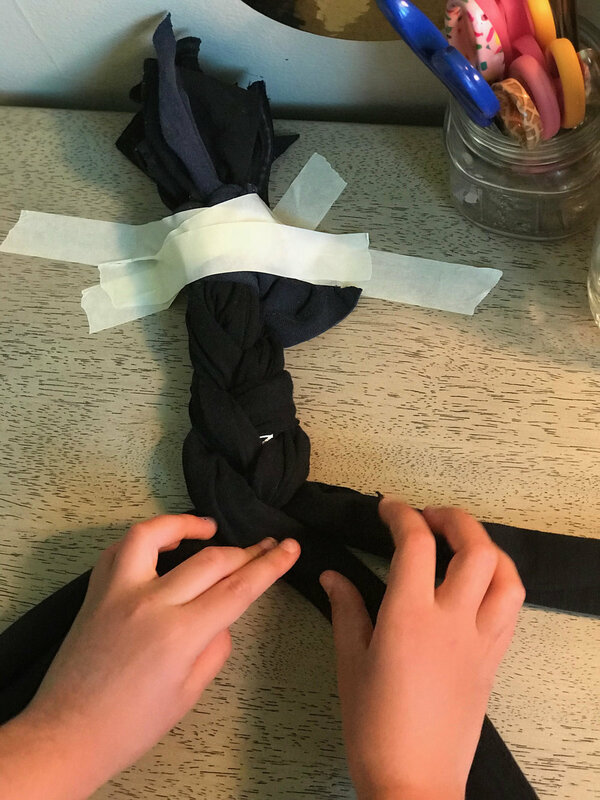 We did this by repeatedly winding this separate strip around the end of the bundle and and eventually using the two ends to tie a secure knot. 4. Finally we separated the 9 strips into 3 groups of 3 and began braiding. We ended the braid with another T-shirt strip wrapped around and around and tied in a final knot. The process was fairly simple and was a fun way for my 7 year old to practice braiding. We ended up with 8 colorful and strong tug ropes of different lengths, depending on whose shirts we used. I then called and set up a time to drop off our donation. The person who I contacted generously offered to give us a brief tour as well. My daughters were thrilled to meet and pet some of their animals including a rabbit and kitten. At the end of the tour my oldest daughter handed one of our tug ropes to a beautiful dog names Jiboo, a Greenhill graduate adopted by their Head of Operations. He is 5 months old and training to be an outreach dog. As you can see below, Jiboo seemed smitten with our gift and we were so pleased. This Simple Service was a perfect reminder that even if you are not able to adopt a rescue animal there are many other ways you can help them and some of these are as easy and fun as cutting up some old shirts. If you are interested in donating tug ropes or other items to Greenhill please check out their Donation Wish List here and follow them on twitter @GreenhillHumane for all their latest fundraisers and events.